Home / News / Showbiz / Viral / Labi Ni Isabel Granada, Nakarating Na Sa Bansa At Binigyan Ng Military Honors Ng Philippine Air Force! Labi Ni Isabel Granada, Nakarating Na Sa Bansa At Binigyan Ng Military Honors Ng Philippine Air Force! The remains of the late Isabel Granada have arrived at the Ninoy Aquino International Airport Terminal 1 Cargo area on November 9 at around 10:00 a.m. Arnel Cowley and Chuckie Dreyfus were present for the arrival of the departed actress’ body. According to reports, Isabel’s remains will be transported to Arlington and then to Sanctuario de San Jose parish in Greenhills East, Mandaluyong. Isabel Granada will receive military honors from the Philippine Air Forces she served as an Airwoman 2nd Class Sergeant in the Air Force for two years. A Philippine Flag was also placed on her coffin in honor of her service. Isabel Granada was declared brain dead on November 5 after she fell into a two-week coma following her sudden collapse at a conference in Doha, Qatar. Her collapse was reportedly caused by a brain aneurysm. Isabel’s bereaved family have expressed their gratitude for the support that many netizens have given them during this trying time. According to News5 reporter MJ Marfori, Isabel’s son with Jericho Aguas, Hubert, admitted to having regrets as he was not given a chance to form a closer bond with his dearly departed mother. He also gave advice to everyone whose parents are still alive, urging them to their time with their parents count. Hubert recalls that he and his late mother had a chance to bond a bit and have a good time prior to her departure to Doha. Isabel’s bereaved family have decided to set a two-day wake before her scheduled cremation on November 12. There will also be a public viewing set on November 10 and 11 (Friday and Saturday) from 10:00 a.m. to 5:00 p.m. for a chance for the public to pay their respects to the actress. 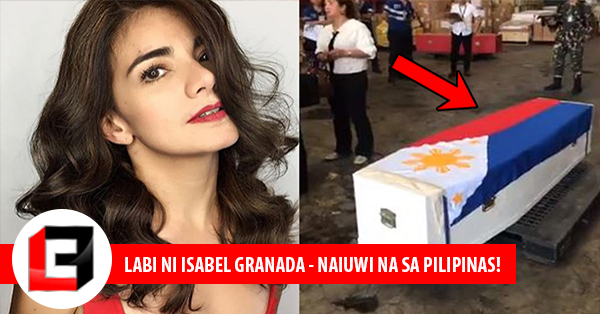 Watch the video of Isabel’s remains arriving in the Philippines below. Mga labi ni Isabel Granada dumating na sa bansa. Isabel, bibigyan ng military honors ng Philippine Air Force dahil nagsilbi siya bilang 2nd sergeant sa loob ng dalawang taon. "May you rest in the eternal glory of God’s Kingdom, Isabel." Don’t hesitate to share your thoughts and prayers for the late Isabel Granada and her grieving family in the comments section below.